Fresh carrots produce sweet nutritious juice. There are many health benefits of carrot juice for people of all ages, whether they are vegetarians, vegans, or meat eaters. Carrots are a very healthy vegetable with plenty of nutritional benefits. Carrots naturally contain high amounts of vitamin A, beta-carotene, and folic acid, and they also offer healthy amounts of calcium, magnesium, potassium, and other minerals. One of the prime benefits of carrot juice is that all of these healthy vitamins and minerals are still available when the carrot is broken down and served as a juice. Many people dislike the texture of raw carrots. Because they're so crispy and firm, very fresh carrots can be difficult to bite into and tough to break down in the mouth. Raw carrots are also hard for young children or older people to eat because they're not always easy to chew and swallow, and the pulp can be tough to digest. Carrot juice eliminates those issues and provides a simple way to consume all the vitamins and minerals found in carrots without having to deal with the vegetable's tough, crisp texture and fibrous pulp. Juicing fruits and vegetables such as carrots can help people get more natural vitamins and minerals than they might get in their diets by eating fresh produce. Because large amounts of vegetables and fruits reduce to only small servings of juices, it's easy to boost your daily servings of fruits and vegetables by juicing them rather than eating them fresh and whole. Carrot juice can be used in cooking or even baking. Adding fresh carrot juice to carrot cakes can enhance the cake's natural sweetness, and using carrot juice in stir fries, soups, and other recipes will help boost the final nutritional profile of the foods. Raw food enthusiasts have long heralded the importance of carrot juice in maintaining good health. Many people who regularly include fresh fruit and vegetable juices in their diets note that carrot juice blends particularly well with other fresh juices and tastes good in many juice cocktails. When carrots are pulped and cooked, more healthful beta-carotene is released and absorbed by the body. 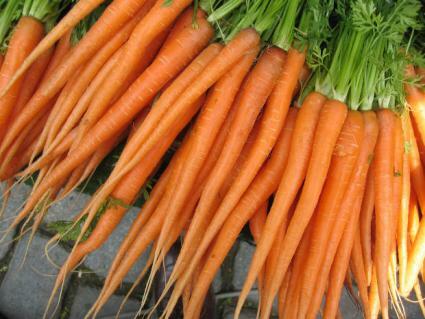 When carrots are eaten raw and whole, only three percent of their total beta-carotene content is released. Carrot juice has a clean, sweet flavor that complements other flavors well and pair successfully with fresh herbs and other items. Trying different carrot juice recipes can help juicers find a version of carrot juice that they like best. It's not hard to prepare and juice carrots, but you will need a good juicer to separate the carrot pulp from the juice. A masticating juicer such as a Champion operates at a slower speed, but requires less prep work because it chews the carrots and separates fiber from the juice.If you use a centrifugal juicer, in some cases a food processor may help prepare the carrots for juicing. It's often easier to juice carrots if you shred them first. Prepare the carrots by washing them thoroughly and removing any dirt or visible stains. Scrape or peel the carrots lightly. Many of their nutrients are near the peels, so preserve clean-looking parts of peels if possible. 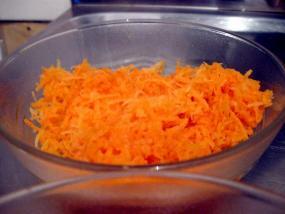 If you have a food processor, place carrots in the processor and pulse until they're shredded and soft. If you don't have a processor, finely chop the carrots yourself with a sharp knife and a cutting board. Add the chopped or shredded carrots to your juicer and follow the manufacturer's instructions to produce the juice. The juicer will separate the carrot pulp from the juice, and the pulp can be reserved for cooking or baking. Enjoy the juice as soon as possible. It's best when fresh and may lose valuable mineral and vitamin content over time due to the oxidation process. Whether juiced, raw or cooked, carrots are a wonderfully healthy vegetable.